If you play soccer, and are grinding for a spot to play, fear no more. 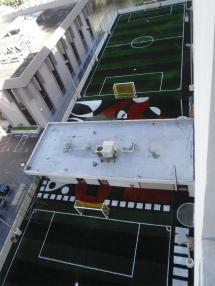 Rooftop soccer is here in Miami! Located near the Capital Grill on Brickell Avenue in downtown Miami, the rooftop soccer complex has two fields that are divided by an air conditioned waiting room equipped with plasma tv, cold beverages, and a place to relax and watch the games from the air conditioned r0om. It’s great for corporate events, and is priced fair at around $100 per hour. Break that down per player on a 5 v 5 or more game, and your in business for a rather affordable price per person. With all of the foriegn soccer stars retiring in Miami, you are sure to see greatness on Brickell Avenue. Here are some of the details of the facility. Two indoor sized fields with nets. Both fields have nets around the perimeter as well as on top. The top net is about 75 feet in the air. An instant success, our own Terry Bender has played with numerous friends so far. It’s a great time to play soccer in Miami, rooftop style.